Manufacturers settle with DeLorean estate. The DeLorean is back! Unfortunately, time travel isn't possible in the new replicas ... just as it wasn't in the original version of the cars. 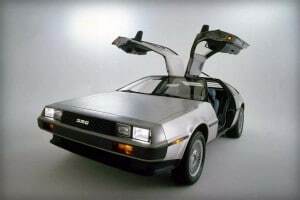 Ready to head “Back to the Future?” Three decades after that iconic ’80s movie made its debut, and 34 years after automotive maverick John Z. DeLorean’s eponymous car company built its last vehicle, the controversial DMC-12 is about to go back into production. Or, at least, a reasonable facsimile. That’s the plan of a small company based in Humble, Texas – which recently settled a long-running lawsuit filed by DeLorean’s heirs. 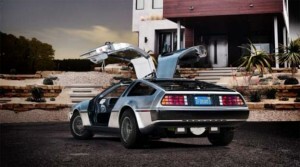 Reviving the name, DeLorean Motor Co., it hopes to have the first of its stainless steel replicas on the road next year – albeit without a flux capacitor. “It’s fantastic. It is a game-changer for us. We’ve been wanting this to happen,” DeLorean CEO Stephen Wynne told TV station KPRC2 in Houston. 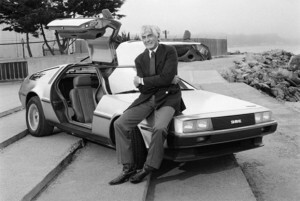 John Z. DeLorean with an original DMC-12. Wynne was a small-town mechanic fascinated by the gull-winged DeLorean DMC-12 when he revived the company’s name in 1995. Only about 9,000 of the originals were ever produced and, by then, many had been junked. He set up shop in a Houston suburb and began restoring any DMC-12 he could get his hands on. He now plans to build complete replicas, which he will sell through a small network of authorized dealerships. They’re expected to go for around $100,000. That’s about twice what a restored original costs. John DeLorean might be proud to see another maverick buck the automotive system. He worked his way up through General Motors, coming up with some of the maker’s most iconic cars of the ’60s and ’70s, such as the Pontiac GTO. But after repeatedly butting heads with management, DeLorean quit and headed off to do things his way. He founded DMC in 1975, working with partners such as Lotus to develop what he promised would be an affordable, high-performance sports car. But everything started to go wrong. The original had a variety of technical issues. Even the stainless steel skin proved to be a problem. And despite a huge cash incentive from the British government to set up a plant in Northern Ireland, DeLorean Motor Co. quickly ran out of cash. The company once contemplated selling a battery version of the DeLorean DMC-12 in 2013. In a scheme caught on videotape, the founder tried to sell a suitcase full of cocaine to undercover FBI agents. He was busted, but, against all odds, convinced a jury he was set up. Acquitted, DeLorean nonetheless lost his by-then-bankrupt company. It produced its last car in 1982. And despite continuing promises, he was never able to get back in the car business. Ironically, the DMC-12’s most famous moment occurred after the company folded. It became a central element in the wildly popular movie series, “Back to the Future.” Character Doc Brown and young Marty McFly were able to travel through time thanks to the addition of a device called a “flux capacitor.” DMC chief Wynne does not plan to offer one on the replicas, unfortunately. The new DMC, at one point, considered offering electric versions of the sports car, though the replicas, at least for now, will stick with gas power. The new DeLorean Motor Co. also sells trinkets and gifts, and it ran into a lawsuit filed by DeLorean’s heirs. Last year, one of John Z.’s former wives, Sally DeLorean and her daughter, reached a tentative deal that will give DeLorean’s heirs a payout and rights to the late automaker’s name and likeness. The Texas company, meanwhile, will be allowed to continued marketing goods and services with the DeLorean Motor Co. name, logo and trademark. This entry was posted on Thursday, January 28th, 2016 at and is filed under Automobiles. You can follow any responses to this entry through the RSS 2.0 feed. Both comments and pings are currently closed.